As anyone who has read my earlier post will know, I am a great admirer of this remarkable woman. I was therefore very pleased to discover that a biography has just been published in her native New Zealand. This book is a delight. The author, Bronwen Wall, is a cyclist and her enthusiasm matches Louise's own. She draws on interviews with Louise's family and friends, newspaper and magazine articles and Louise's own memoirs and diaries to create a picture of her remarkable life.There are also many fine photos of Louise who always seems to be beaming! There is nothing in Louise's first book 'I Follow the Wind' to suggest that she had any great cycling experience. Actually since she was nineteen she had been going on long rides in some of New Zealand's most remote places, in foul weather, and often overnight. The matron of the hospital where she worked even wrote to her parents to say that she thought these cycling holidays were not suitable for a student nurse as she was returning to work more tired than she was before! Her return from her round the world trip was by no means the end of her cycling. Her forthcoming marriage was put on hold so that she could spend 4 months cycling in Scandinavia. She unintentionally became the first cyclist to reach the North Cape, arriving there only a week after the road opened. She was unable to realise her ambition to cycle in Russia despite requesting permission from Khrushchev himself! She was still the first person to cycle behind the Iron Curtain, cycling through Poland, Hungary and Czechoslovakia in the mid 1960s. She had firm views on cycle touring and equipment. She considered a 3 speed hub gear more robust than a derailleur system and the load carrying capabilities of a trailer to be far superior to panniers. I wonder what she would think of a Rohloff hub? Her appearance was always very feminine (rather than feeling that this made her vulnerable she felt that it afforded her protection) and she designed and made her own skirts for cycling. She also spent many a long wet ride designing the perfect cycle cape but was unable to find a manufacturer for it. Its a pity no record of it remains. Louise's amazing ride along the Trans Amazonian highway was meant to have been a joint enterprise with cycle touring legend Ian Hibell. There are rumours that even he backed out when he realised the scale of the undertaking!! It was he who persuaded her to switch to a derailleur geared bike with panniers. On her return from the Amazon she devoted herself to raising funds to equip a mobile clinic to help the indigenous people there. By 1985 she had raised enough to achieve this although the political situation in Brazil meant that this success was short lived. In 1991 she was the first foreigner to be awarded the Golden Fish award for her services to Brazil and in 1993 she received the Queens Service Medal in New Zealand for this work. She died suddenly on Christmas Eve 1994 at the age of 68. I thoroughly recommend this book, it was a pleasure to read from beginning to end. 'Louise Sutherland, Spinning the Globe' by Bronwen Wall can be purchased from www.kennett.co.nz. It took just over a week to arrive and cost 20NZ$ (approximately £11.50 including postage). Posted by Hilary on November 17th, 2010. Reading 'I Follow the Wind' (nice little book) there was very little about her actually cycling. She'd mention in passing that she cycled through some desert or another and it was hot, almost as if it was all perfectly natural. 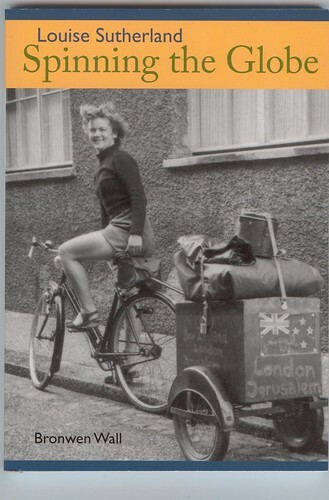 Perhaps this new book by Bronwen Wall is more cyclist-oriented. I might buy it for Mrs Taylor's Christmas stocking. Impressive woman. Lovely pair of legs. Um, sorry, I mean lovely pair of wheels. How much stuff has she got in and on the trailer? Too much for panniers, I'd say. The bike seems to be single speed. I'm always impressed by long-distance cyclists who manage with anything less than a dozen gears. I met a German in Dublin about 1977 who'd been cycling around the world for 18 years. The last I heard of him a few years ago, he was still doing it. You perhaps met Heinz Stücke. He set off in 1962 and might well still be doing it, whatever 'it' is. He's not so much a cycle tourist as a homeless nomad. Not a patch on Louise Sutherland. Great review. Think I shall add this to my Christmas list.